Success! Joseph made me a special wheat-free/gluten-free focaccia bread recipe. I tried it and it worked. It is the best bread I have eaten in four years. I dipped it in warm marinara sauce. Mmmmm.... Scott wasn't as much of a fan, but he never is if he knows it's Ali safe. Thank you Joseph!!!! 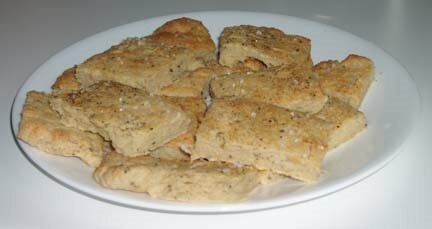 For the recipe, click on "Joseph's Fantastic Food Stuffs" link to the right, then click on "For Ali: Gluten-free Focaccia". I did not know that you were allergic. I was trying to remember when you came for that visit, when you were like 14-15 years-old or older, if you ate special food, but I could not. I did remember that the night before you left, the neighbor kid shot his friend. Good memory. I also remember the shooting. As far as the allergies go, they didn't appear until I was in my 20s. I got diagnosed four years ago and it has made eating a very interesting endeaver.